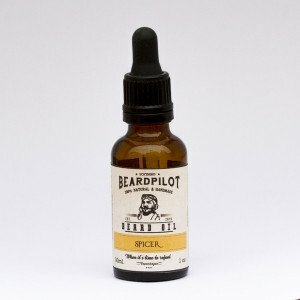 Oh damn, Beardpilot ‘Spicer’ Beard Oil is simply amazing and it has flown itself to the top of my favourite beard oils list! ‘Spicer’ Beard oil from Beardpilot is Orange, Lemon and Cinnamon scented and I have tested quite a few oils that contain Cinnamon but this is a winner. ‘Spicer’ Beard oil from Beardpilot is made up of Apricot, Sweet Almond, Grape seed, Jojoba and Argan carrier oils with Citrus Orange, Lemon and Cinnamon bark essential oils. Normally oils that contain Cinnamon have a spicy and peppery scent but I think that is down to the fact that they normally use Cinnamon leaf oil and this used Cinnamon bark oil and that combined with the sweet and zesty orange and lemon oils gave off a beautiful aroma that is very like a Cinnamon bun and anything that smells like cinnamon bun gets my vote! Now obviously there is a lot more than scent to a Beard but Beardpilot has got that covered as well, I personally like a heavier beard oil and this oil is just that. A slightly heavier oil keeps a bigger and or messier beard in check and I like Argan oil for this reason. ‘Spicer’ left my beard smelling and looking good and it also felt soft and did everything that I would want from a beard oil. Then we have the Beardpilot branding, I’m not sure I need to say much about this as the photo above that I took when the products arrived, speaks for itself! ‘Spicer’ Beard oil from Beardpilot is available from their website and comes in a 30ml/1oz glass bottle with a glass dropper dispenser for 249,00 kr which at today’s exchange rate is about £26.20 but remember to keep an eye on the exchange rates. A big thank you to Salem for allowing me to test and review his products.